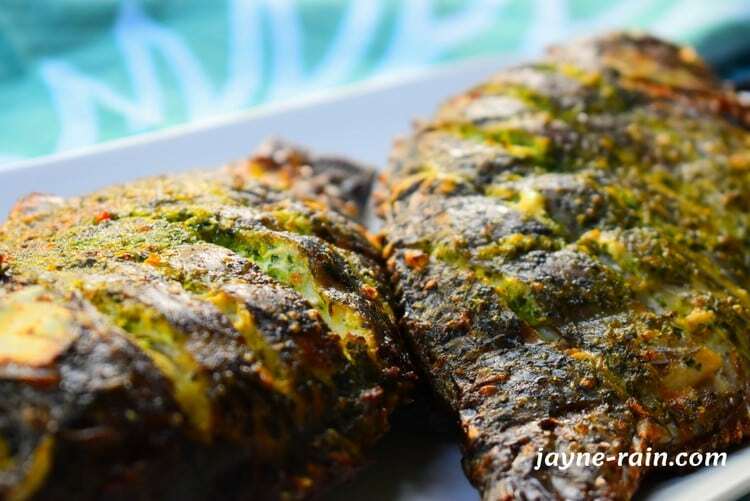 This spicy oven grilled tilapia fish is infused with the delicious combination of green spices, garlic, ginger, and lemon. The crispy herb-coated skin and the juicy herb-infused interior is to die for. If so inclined, use dry herbs instead of fresh but if you want to take this fish to another level, invest in using fresh herbs. This oven grilled tilapia fish pairs well with fried plantains and West African pepper sauce. I guarantee your family and friends will love it and ask you for the recipe. This is a classic African way to season fish before grilling it on a charcoal grill or in the oven. It is marinated overnight in this green, flavorful and spicy marinade for best results. Overnight marination allows the fish to absorb the flavors of the marinade resulting in a fish that is so tasty to the core. For an extra burst of flavor, I add habanero pepper in my marinade. Add more or less pepper depending on your tolerance. 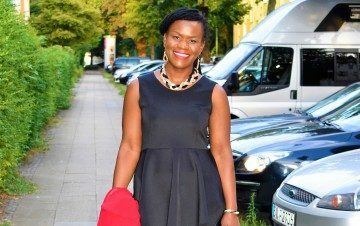 I belong to the Nilotic people and fish happens to be our staple source of Protein. Therefore, I grew up eating a lot of fish, mostly Tilapia. It is my go-to variety of fish most of the times, but this recipe works well on whole mackerel fish as well. Tilapia fish has a milder taste and odor compared to other types of fish; a trait that is appealing to me. Tilapia fish has scales which must be removed before cooking. To do this, place the fish on a flat surface and hold firm with one hand. Hold a knife or spoon with the other side and use moderate force to scrape it from the tail toward the head to remove the scales. Cut the belly open with a knife an use your fingers to pull out the innards. Then, use a spoon to scrape out any of the innards you missed. Rinse the inside of the fish under cold water until the water runs clear. After cleaning the fish, pat the fish dry with paper napkins. Make 2 to 4 deep cuts on both sides of the fish. These cuts will allow the fish to absorb the marinade better. After that, coat the fish well with the marinade and place in a large re-sealable plastic bag. Finally, seal the bag and refrigerate it for at least 1 hour but preferably overnight. In a blender, combine lemon juice, olive oil, cilantro, spring onions, ginger, garlic, red onion, salt, bouillon powder, habanero pepper and basil leaves. Blend till smooth. Save 1/4 of the marinade for brushing the fish while baking. If the tilapia is frozen, allow it to defrost in the refrigerator. After that, wash the fish in cold water, removing scales, gills, and all unwanted parts. Rinse thoroughly and pat the fish dry with paper napkins. Make 2 to 4 deep cuts on the fish. These cuts will allow the fish to absorb the marinade better. Coat the fish well with the marinade and place in a large re-sealable bag. Seal the bag and refrigerate it for at least 1 hour but preferably overnight. Meanwhile, coat the grilling metal rack with some oil to prevent the fish from sticking while backing. When ready to grill, remove the tilapia from the bag and place on hot grilling rack. Brush the tilapia with the marinade you saved aside. Grill the fish for about 20 minutes and gently flip to grill the other side. Brush the other side with marinade and grill for another 15 minutes. Finally, remove the oven grilled tilapia fish from the oven and serve. 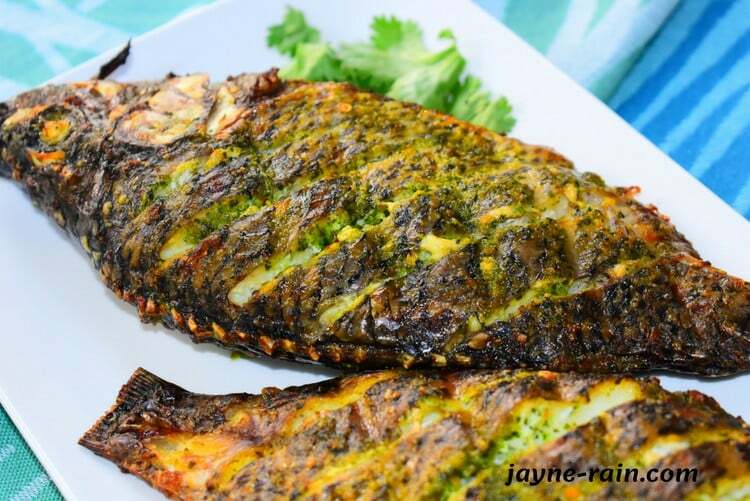 Spicy oven grilled tilapia fish - infused with the delicious combination of green spices, garlic, ginger, and lemon. The crispy herb-coated skin and the juicy herb-infused interior is to die for. If so inclined, use dry herbs instead of fresh but if you want to take this fish to another level, invest in using fresh herbs. 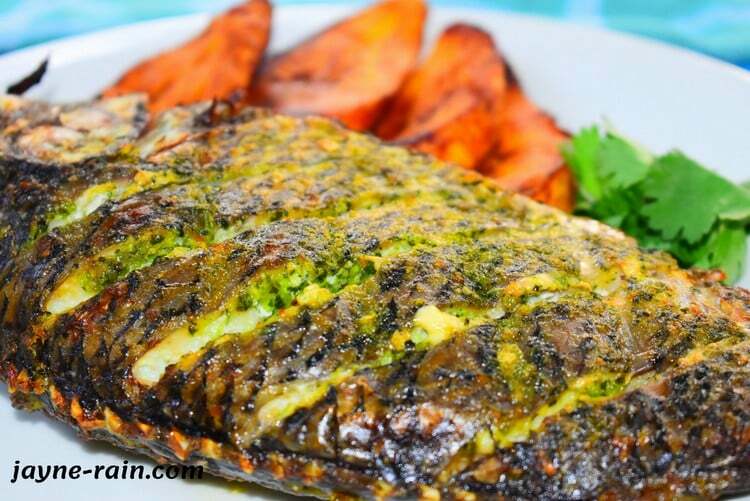 This oven grilled tilapia fish pairs well with fried plantains and West African pepper sauce. I guarantee your family and friends will love it and ask you for the recipe. What do you think about this oven grilled tilapia fish? Meet me in the comment section below and share your thoughts because I would love to hear from you.